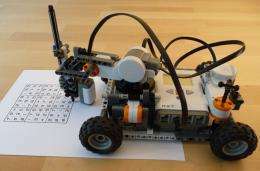 (PhysOrg.com) -- A Swedish programmer, Hans Andersson, has used a Lego Mindstorms NXT kit to develop a robot to solve Sudoku puzzles. Andersson first purchased the Lego Mindstorms kit for his daughters, but couldn't resist playing with it himself. The robot first scans the puzzle and uses an optical sensor to map out the puzzle's pre-set numbers and blank squares. The robot scans one line at a time, inching forward a little after each line is scanned. The blurry scanned image is then converted to a black and white binary image to improve the sharpness of the picture. A threshold value calculated by Otsu's Method is used to determine whether each pixel in the image is white or black. The Otsu Method algorithm classes pixels as either foreground or background, and then determines the optimal threshold that minimizes the intra-class variance. Pixels below the threshold are set to black, and those above are set to white. A thinning algorithm is then used to convert the resulting image of each digit to 1-pixel wide lines. The digits are then examined for features such as their width, and the number and direction of tips on the digit. The digit six, for example, has one tip, which points to the right. Following this procedure for each digit, the robot identifies all the pre-set numbers in the puzzle. Once the puzzle is mapped, the robot solves it and fills in the blank squares. A recursive backtracking algorithm would normally be used to solve puzzles such as Sudoku, crosswords, or other puzzles in which the solution has several candidates. The method carries out a systematic examination of all possible solutions, and abandons and does not re-visit any that are eliminated. The Lego Mindstorms processor is too slow to use a backtracking algorithm and it does not allow for recursive functions, so Andersson had to make sure the calculations were optimized. The result is a little robot that can solve Sudoku puzzles and get them right every time, and in only a few minutes.